Julia and I look a little fearful of the fried food. Chocolate-covered strawberry waffle balls. S’mores. Chocolate truffles. Jelly Belly beans. Peanut butter and jelly. Grilled cheese. A banana split. Either the thought of this makes you want to indulge in the gooey goodness of it all, or it makes you want to hurl. I fall somewhere in between these two extremes. I hardly ever eat fried food, except for an occasional order of French fries. But as I learned this weekend, there’s no excuse for not eating greasy treats at the Texas State Fair. Practically everywhere you look, there are fried food stands tempting passerby to indulge. 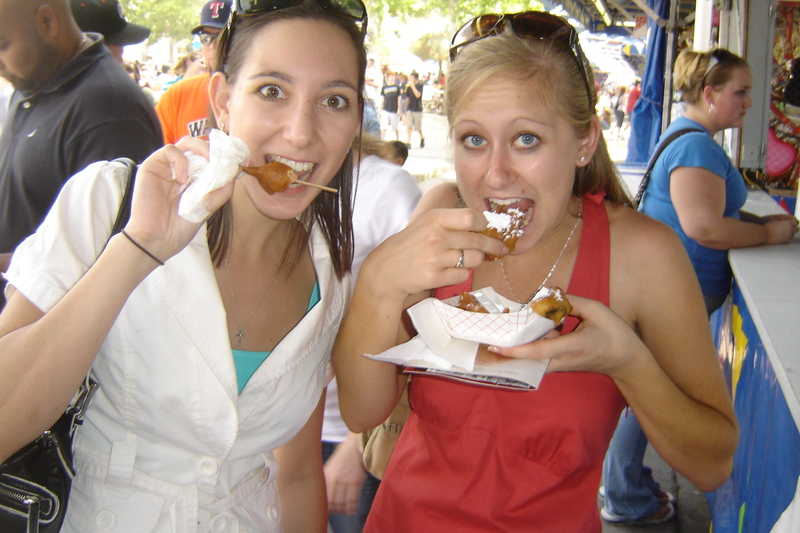 While my roommate from college, Julia, munched on a corny dog (they’re called “corny dogs” in Texas, not corn dogs), I waited in line at a stand that was selling fried snowballs, fried Snickers and fried Oreos. I went for the Oreos — three greasy, gooey, chocolaty Oreos nestled in a ball of batter, to be exact. They were gross, but at the same time so good. Since I had eaten fried Oreos, I figured I might as well do something else I normally don’t do – ride a ferris wheel. I hadn’t been on a ferris wheel for about 10 years, mainly because I’m afraid of heights. But as I watched little kids waiting in line wearing smiles, I told myself it couldn’t be all that bad. Why not face my fear by riding the largest ferris wheel in North America? I faced my fear of heights by riding the largest ferris wheel in North America. I stepped inside the little cage that would take us to the top and grabbed onto Julia’s hand, keeping my eyes closed like a child. When I was younger, I’d scream “Stop the ride!” whenever I got scared. But there was no screaming on this ride. As we approached the top, I opened my eyes and admired the view. I actually liked being 212 feet above ground and seeing the state fair from a different perspective. It wasn’t nearly as frightening as I thought it’d be. Now all I need to do is go on my first roller coaster! –I like to daydream and I have a vivid imagination. –I tend to procrastinate on routine projects. –I have a retentive memory for things that are important but am forgetful of minor details. — I have good taste and dislike anything that is cheap and gaudy. –I worry too much about things I can’t change. –I am strong-willed and have very definite ideas regarding most things in life. –I sometimes enjoy being a nonconformist. –I have the ability to negotiate or talk people into my way of thinking. I’d say that’s a pretty good assessment, actually. 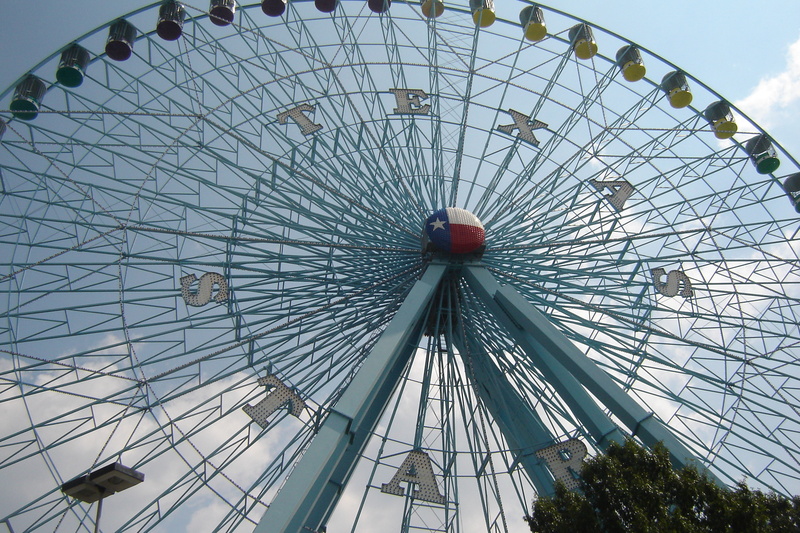 What do you like to do/see at the Texas state fair, or at state fairs in general?